For the convenience of our clients, we have created a LawPay® online payment portal. 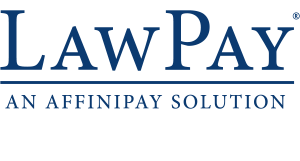 LawPay® is a safe and secure credit card portal designed for lawyers, and made available to our clients, so you can pay with a credit card from the comfort of your own home, office or other location. To pay your bill, or to replenish your retainer, simply click the button below and fill out the information on our LawPay® website portal.